Southern Naturals handcrafted soaps leave your skin feeling fresh, clean and moisturized. Our handmade soaps are made with 100% natural ingredients and have a rich creamy lather that cleans your skin without drying it out. Once you treat your skin to a bar of Southern Natural's handmade soap, you’ll never want to use anything else! At Southern Naturals I hand make all of my soap using the old fashioned cold process method. This means I do not cook the soap to ensure the revitalizing nutrients remain intact and to yield the benefits of aromatherapy. I am not a large manufacturer. All of my home made soap and bath products are hand crafted in small batches to ensure you are receiving a high quality product. All Natural and 100% Junk Free each soap bar is 3.5 - 4.5 oz. and made with plant-based sources such as Olive Oil, Cocoa Butter, Shea Butter, Mango Butter, Coconut Oil, Palm Oil, Castor Oil, fruits, herbs, the finest pure, therapeutic grade essential oils and an unmeasurable amount of LOVE! I don't use artificial dyes, fragrances with phthalates, preservatives, or detergents in any of my soaps. 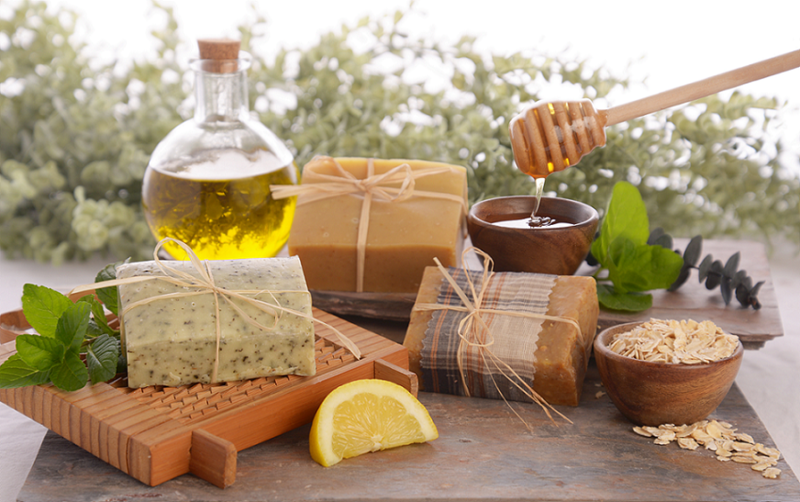 I allow the natural oils to scent the soaps, and let the herbs, spices, coffee and nourishing extras like honey give the soaps their natural colors. Most are vegan, but some contain honey and/or beeswax so if this is important to you, please check with me for the ingredients. Customization is also available with a minimum purchase of 10 bars. Southern Naturals handcrafted soap is a wonderful choice for sensitive or easily irritated skin. They are naturally gentle and do not contain any of the chemical additives that are often responsible for skin irritation. Everyone’s skin is different, so if you have extremely sensitive skin, try one of my lavender or fragrance free bars. How is handmade soap different from store bought soap? The difference is in the ingredients! Southern Naturals handmade soaps are made from vegetable oils that nourish and protect your skin. No tallow (animal fat) and other low-cost oils are used in my soaps. Handmade soaps are rich in glycerin, a natural skin-softening moisturizer that is created during the soap making process. My handmade soaps are gentle and 100% natural, have a rich creamy lather, and clean your skin without drying it out. Once you treat your skin to a bar of Southern Natural's handmade soap, you’ll never want to use anything else! II Timothy 1:7 For the Spirit God gave us does not make us timid, but gives us power, love and self-discipline.